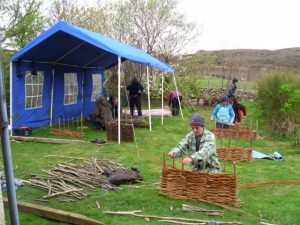 Have the chance to make a plant support and a small woven hurdle or fence for your garden. We ran a great course making plant supports earlier on in July, see photos. Hurdles were traditionally used as mobile, temporary fences for sheep enclosures. They were light and the shepherd could carry them in and out of the fields. Today they form decorative, strong boundaries or edges in gardens. This second part of the course is about learning the techniques so that you can construct your own wattle fences in your allottment or gardens. We will make a 3′ x 2′ panel as a sample piece of fencing.